"A Day at the Blue Lagoon"
Julie and I continued to head further south from Bouma to the road’s end at the village of Lavena. It was a little after 11am when we got there. 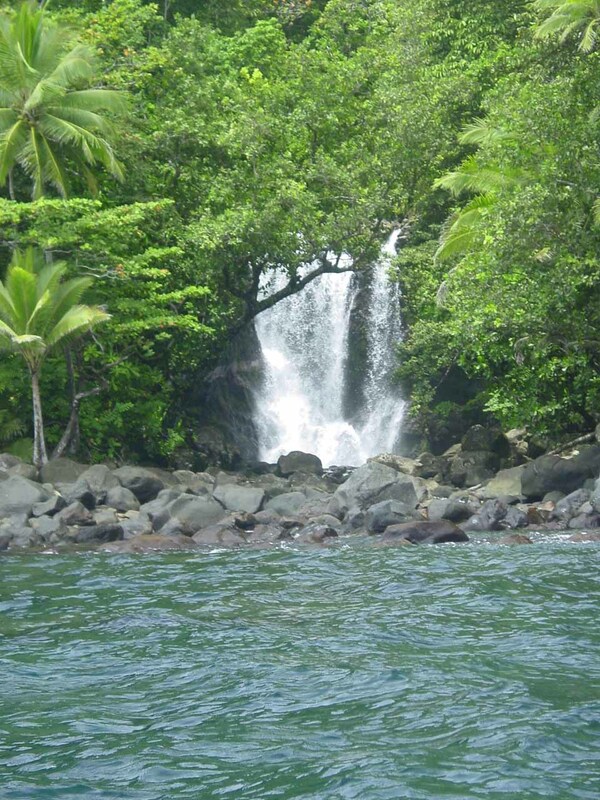 With the bright and sunny New Years Day upon us in full effect, we walked over to the visitor center to inquire about seeing the Savulevu Yavonu Waterfall, which required a boat hire. 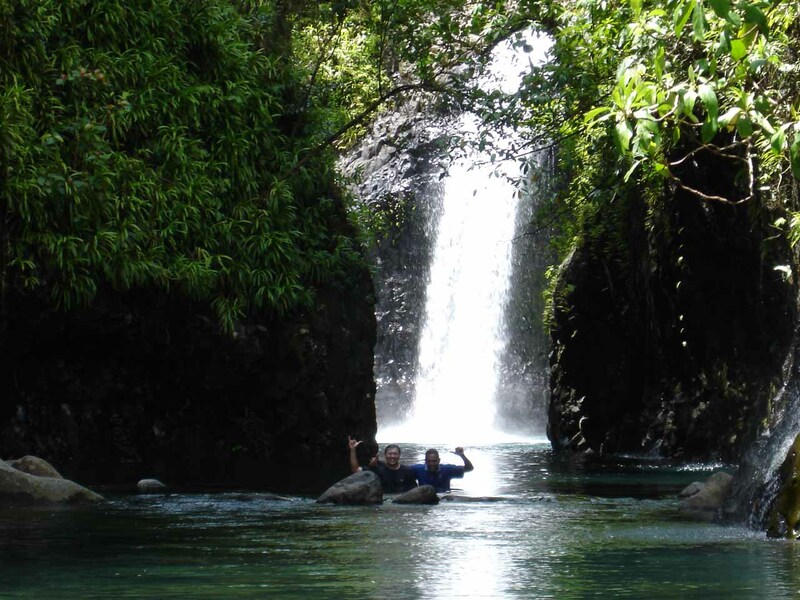 When they also learned that we also wanted to do the Lavena Coastal Walk, they told us that we could boat to the sea-bound waterfall first and then they could drop us off at the estuary downstream of Wainibau Falls so we could do the walk in just one direction. I had never thought of this before and thought it was an excellent idea. The only caveat to all this was whether the seas were calm enough to boat all the way out to the Savulevu Yavonu Waterfall. And to our relief, they said the seas were beautiful today. 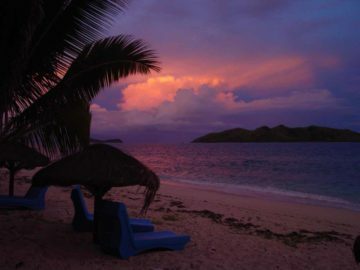 So with that, we were on the primitive looking motor boat with two Fijians. One of them, who calls himself Augustino, was going to be our guide on the land-based walk while his larger compadre steered the boat. Even though the seas were said to be calm, there was still lots of up-and-down action as the boat went over each swell. I hated to imagine being caught here in rougher seas. 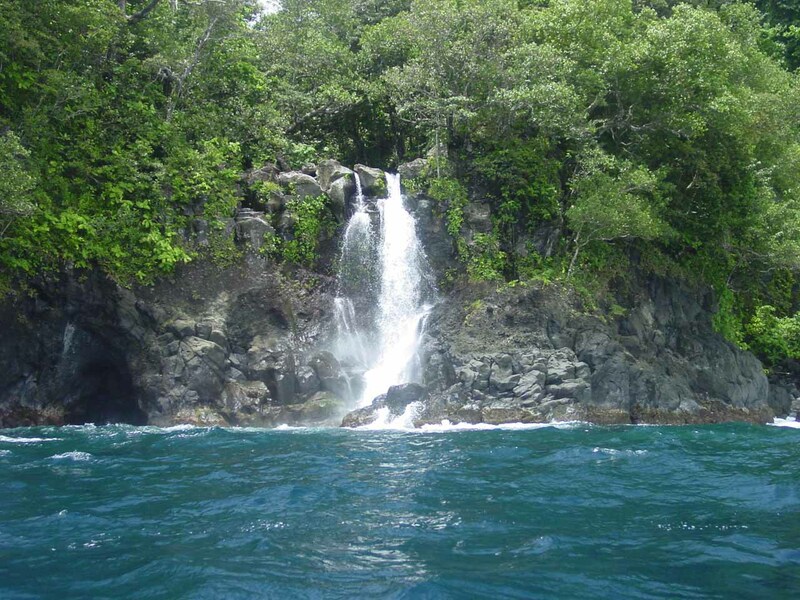 Nonetheless, we were treated to several sea-bound waterfalls on Taveuni’s scenic east coast. There was even one that fell behind a village that was further south from Lavena. Austino told us that he has many relatives who live there and they make frequent hikes back and forth to do some family bonding. Of course, today was New Years Day and we knew there was lots of kava drinking and a general sense of community as we had witnessed this throughout this week. 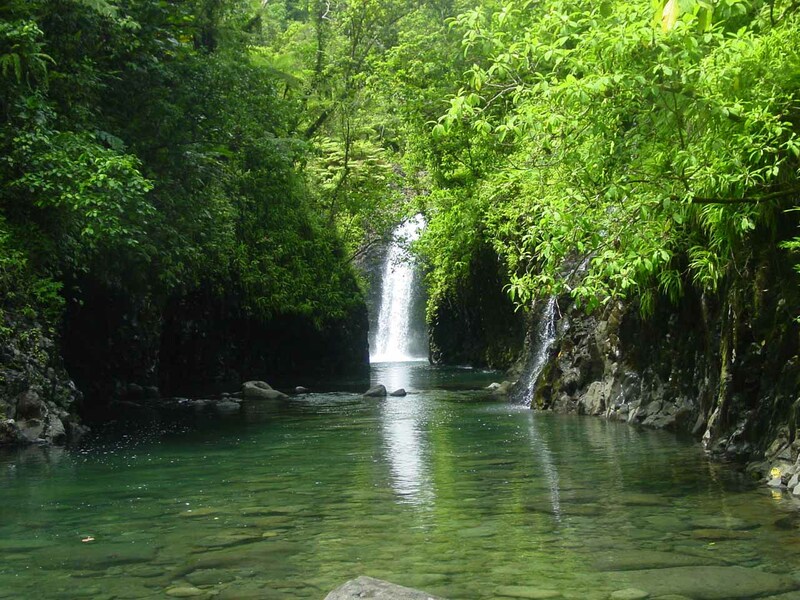 At 12:15pm, we finally saw the attractive 20m Savulevu Yavonu Waterfall. I had read in Lonely Planet that sailors used to use this waterfall for drinking water. But given the oscillating seas and the jumbles of rocks at its base, I wondered how they accessed it safely without getting shipwrecked. Austino told us that the waterfall used to flow directly into the sea before a landslide filled the base with rocks and sediment. The falls were an interesting photo subject, but it wasn’t all that extraordinary. So the boat started making its way back up the coast. As we got towards the confluence of the Wainibau Stream and the ocean, the boat driver decided he was getting too hot from the tropical heat. So he stopped the engine and jumped right into the relatively tame water for a swim. He went on to swim towards the spot where the boat was going to drop us off for our hike. And with that, the driver regained the boat while Julie, Augustino, and I were now on the trail. The waterfall was only a few minutes upstream so I looked forward to going for a swim to cool off. By 1:15pm, we had made it to the end of the trail. Along the way, Augustino pointed out an orange dove to us, which he said was rare. We weren’t really bird watchers, but seeing an orange bird isn’t something that you see everyday. Too bad I didn’t have a telephoto lens to capture it. Anyways, Julie didn’t wasn’t in the mood to put her recently-learned swimming abilities to the test so she sat at trail’s end photographing both me and Augustino backstroking and breaststroking our way towards the falls. We had to swim towards the left side of the passage towards the embanking rock wall to avoid getting pushed downstream by the current. Even though the falls could be seen from trail’s end, the swimming to the base of the falls revealed another smaller waterfall facing the main one. Augustino used that waterfall to jump off of it while I took photos with the waterproof disposable camera. We lingered here for a while when I thought it was time to rejoin Julie. She took a few more photos of Augustino and I swimming towards her and posing for the camera. By 1:30pm, we regained our packs and started the hike back towards the village of Lavena.